Governments have attempted to eliminate or mitigate financial crises by regulating the financial sector. One major goal of regulation is transparency: making institutions’ financial situations publicly known by requiring regular reporting under standardized accounting procedures. Another goal of regulation is making sure institutions have sufficient assets to meet their contractual obligations, through reserve requirements, capital requirements, and other limits on leverage. Some financial crises have been blamed on insufficient regulation, and have led to changes in regulation in order to avoid a repeat. For example, the former Managing Director of the International Monetary Fund, Dominique Strauss-Kahn, has blamed the financial crisis of 2008 on ‘regulatory failure to guard against excessive risk-taking in the financial system, especially in the US’. Likewise, the New York Times singled out the deregulation of credit default swaps as a cause of the crisis. However, excessive regulation has also been cited as a possible cause of financial crises. 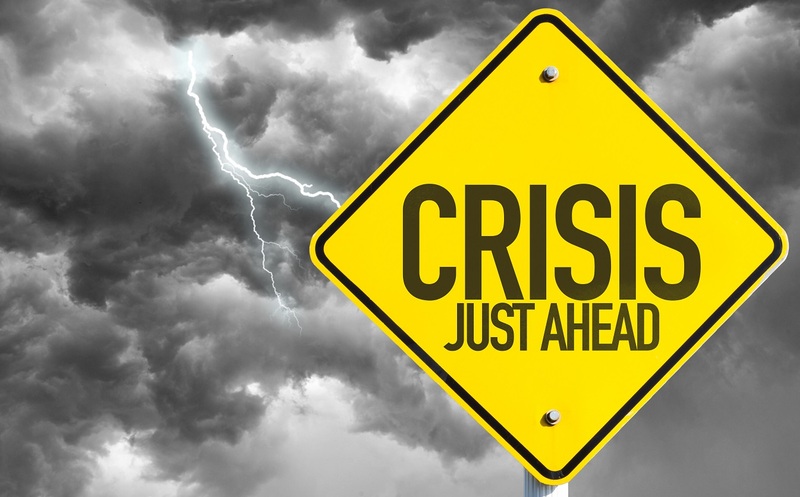 In particular, the Basel II Accord has been criticized for requiring banks to increase their capital when risks rise, which might cause them to decrease lending precisely when capital is scarce, potentially aggravating a financial crisis. How did this happen? First and foremost, free market capitalism creates its own crisis. The fallacy that markets can regulate themselves has now been exposed as false. Mr. Allan Greenspan the former Chairman of the US Federal Reserve Bank and a staunch believer of free market has also admitted that markets cannot regulate themselves. The system created a global casino system which rests on virtual wealth. Finance has been detached from real economy. The Indian economist C.T. Kurien uses a metaphorical definition of two planets namely, “Planet Finance” and “Planet Earth.”. Secondly, new financial instruments and institutions were formed to manage this unjust and unfair system that punishes those who produce real assets and rewards those who do nothing except to speculate. Usury has been legitimized and institutionalized. This system has created financial bubbles that have bust. The AGAPE background document at the WCC’s Assembly in Porto Alegre (2006) warned against dependence on deregulated financial markets. Economists such as Korten identify the failure of Wall Street institutions that have perfected the art of creating “wealth” without producing anything of real value. Korten sums this up as creating phantom wealth. His hope is not in Wall Street but on the Main Street. In a survival situation, food shortages is important. How long has it been since you have been hungry? How long have you ever gone without eating? After the basic necessities of shelter and water, food is the next item of concern. If you don’t have a good supply, and sometimes even if you do, hunger and even starvation is something that you must confront. When it strikes will you be prepared? Panic is the first response of many individuals to hunger and the threat of starvation. It is helpful to know how the human body responds to hunger and starvation, how it affects one mentally and physically and how long one can go without food. Hunger and starvation have been the subject of carefully controlled. The period during and following major wars has been characterized by hunger, starvation and often death by starvation. The second world war saw the destruction of the food production and distribution infrastructure through all of Europe and Asia and affected the rest of the world including the United States. Everywhere the allied armies went, they encountered populations with their infrastructure damaged and unable to sustain them. They also encountered prison camps with large numbers of critically starved prisoners. They also took prisoners who had to be fed. The war effort quickly turned from fighting to providing relief in the occupied areas. The world financial system is as dangerously stretched today as it was at the peak of the last bubble but this time the authorities are caught in a 'policy trap' with few defences left, a veteran central banker has warned. "All the market indicators right now look very similar to what we saw before the Lehman crisis, but the lesson has somehow been forgotten," said William White, the Swiss-based head of the OECD's review board and ex-chief economist for the Bank for International Settlements. Prof White said disturbing evidence of credit degradation is emerging almost daily. The latest horror is the revelation that distressed UK construction group Carilion quietly raised £112m through German Schuldschein bonds. South African retailer Steinhoff also tapped this obscure market, borrowing €730m. Schuldschein loans were once a feature of rock-solid lending to family Mittelstand companies in Germany. 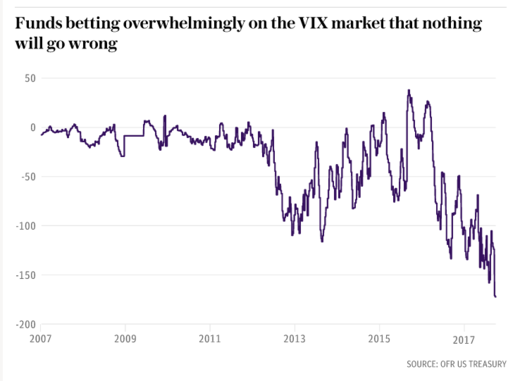 The transformation of this corner of the market into a form of high-risk shadow banking, apparently to evade scrutiny, shows how badly the lending system has been distorted by quantitative easing (QE) and negative interest rates. Prof White said there is an intoxicating optimism at the top of every unstable boom when people latch on to good news and convince themselves that risk is fading, but that is precisely when the worst mistakes are made. Stress indicators were equally depressed in 2007 just before the storm broke. This time central banks are holding a particularly ferocious tiger by the tail. Global debt ratios have surged by a further 51 percentage points of GDP since the Lehman crisis, reaching a record 327pc (IIF data). Every part of the world economy is exhibiting some deformed pathology. 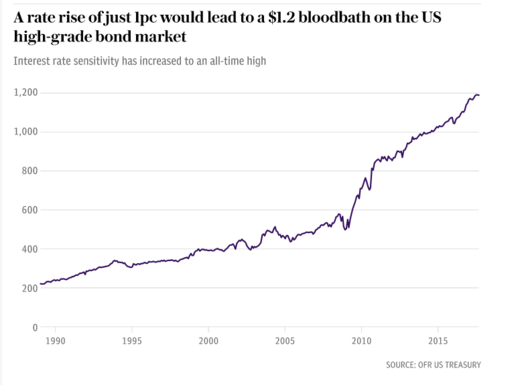 This is a new phenomenon in economic history and can be tracked to QE liquidity leakage from the West, which flooded East Asia, Latin America, and other emerging markets, with a huge extra push from China pursuing its own torrid venture. "Central banks have been pouring more fuel on the fire," he told the Daily Telegraph, speaking before the World Economic Forum in Davos. "Should regulators really be congratulating themselves that the system is now safer? Nobody knows what is going to happen when they unwind QE. The markets had better be very careful because there are a lot of fracture points out there," he said. "Pharmaceutical companies are subject to laws forcing them to test for unintended consequences before they launch a drug, but central banks launched the huge social experiment of QE with carelessly little thought about the side-effects," he said. The US Federal Reserve is already reversing bond purchases - ignoring warnings by former Fed chair Ben Bernanke - and will ratchet up the pace to $50bn a month this year. It will lead to a surge in supply of US Treasury bonds just as the Trump Administration's tax and spending blitz pushes the US budget deficit toward $1 trillion, and just as China and Japan trim Treasury holdings. It has the makings of a perfect storm. 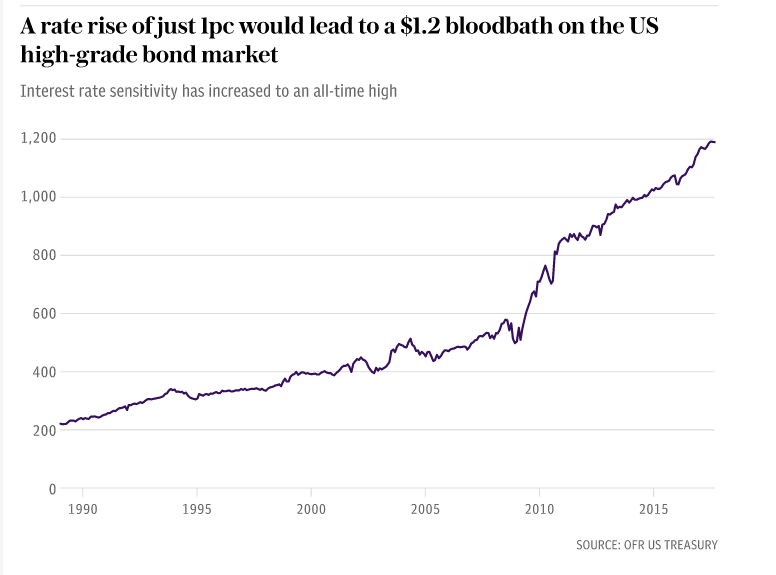 At best, the implication is that yields on 10-year US Treasuries - the world's benchmark price of money - will spike enough to send tremors through credit markets. We are not close to the danger point but the yield crept up to a three-year high of 2.66pc last week. It has broken out of its 36-year downtrend, prompting loud warnings of a secular bond rout. The edifice of inflated equity and asset markets is built on the premise that interest rates will remain pinned to the floor. 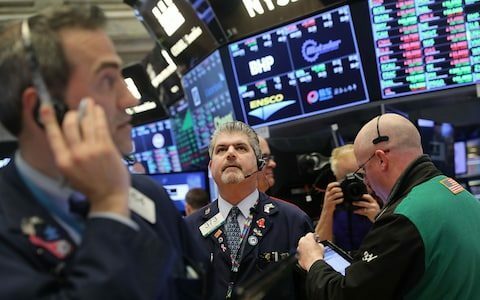 The latest stability report by the US Treasury's Office of Financial Research (OFR) warned that a 100 basis point rate rise would slash $1.2 trillion of value from the Barclays US Aggregate Bond Index, with further losses once junk bonds, fixed-rate mortgages, and derivatives are included. It said losses could dwarf the "bond massacre" that bankrupted Orange County California in 1994 - and detonated Mexico's Tequila Crisis. The global fall-out from such a shock could be violent. Credit in dollars beyond US jurisdiction has risen fivefold in 15 years to over $10 trillion. "This is a very big number. As soon as the world gets into trouble, a lot of people are going to have trouble servicing that dollar debt," said Prof White. The offshore dollar funding markets would dry up, triggering a liquidity squeeze. Borrowers would suffer the double shock of a rising dollar, and rising rates. The OFR report makes unsettling reading. "The cyclically adjusted price-to-earnings ratio of the S&P 500 is at its 97th percentile relative to the last 130 years," it said. Margin debt on Wall Street has risen to an all-time high, as has the share of risky bonds with minimal protection. So-called 'covenant-lite' contracts are now running at 51pc of all issuance. The top decile of macro hedge funds has raised leverage to 15 times, accounting for $800bn in gross assets. While banks now have high capital buffers, the risk has migrated elsewhere: to investment funds concentrated in crowded trades. The share of equities traded in "dark pools" outside the exchanges has mushroomed to 33pc. "A lack of market liquidity may lead to fire-sale risk, a downward price spiral," it said. One worry is what will happen to 'risk parity' funds when the inflation cycle turns. RBI Capital warned in its investor letter that these funds could lead to a "liquidity crash". Deutsche Bank has advised clients to take out June 2018 'put' options on the S&P 500 - a hedge against a market slide - arguing that the rally looks stretched and that risk parity funds will amplify any correction. These funds manage risk by matching bonds and equities through dynamic weighting. The strategy worked marvelously during the 'Goldilocks' phase of low inflation and rising stock markets. Both wings of the trade did well. The danger is that both could go wrong at the same, setting off a vicious cycle in the opposite direction. Funds have doubled-down on the trade with leveraged bets on Treasuries to boost returns. "A breakdown of this strategy poses the greatest threat to the overall market," says Peter Tchir from Brean Capital. In a sense, risk parity funds may be today's equivalent of the 'portfolio insurance' that accelerated the crash in October 1987. Whether the inflation cycle is really turning, and how fast, is the elemental question of this bull market. What is clear is that the US has closed the output gap and is hitting capacity constraints. The New York Fed's underlying inflation gauge rose to a 12-year high near 3pc in December. The great disinflation of the last three decades was essentially a global 'supply shock'. The opening-up of China and the fall of the Berlin Wall added 800 million workers to the traded economy and labour pool, depressing wages and unleashing a tsunami of cheap goods. The 'Amazon effect' of digital technology capped price rises. The demographics of the baby boom era played its part by boosting the global savings glut. But there was another feature that is often neglected. Central banks intervened "asymmetrically" with each cycle, letting booms run but stepping in with stimulus to cushion busts. The BIS says one result was to keep insolvent 'zombie' companies alive and block the Schumpeterian process of creative destruction that leads to rising productivity. This artificially stopped supply returning to balance. It has been a cause of the deflationary malaise. 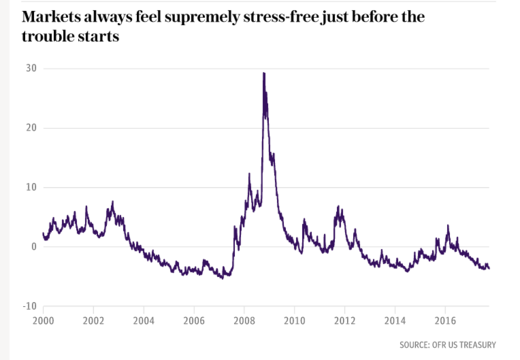 "Everything could now go into reverse: the baby boomers are gone; China's working age population is falling; and zombie companies are going to be forced out of business at last as borrowing costs rise," White said. While higher inflation is needed in one sense to right the global ship - since it lifts nominal GDP faster, and whittles down the debt stock - the obvious danger is that the shock of higher rates will hit first. Debt dynamics could spin out of control. Japan and Italy are in the firing line. The US has more margin but is being cavalier with fiscal expansion a l'outrance and no reform of its entitlement programmes. "This raises the danger of 'fiscal dominance'. 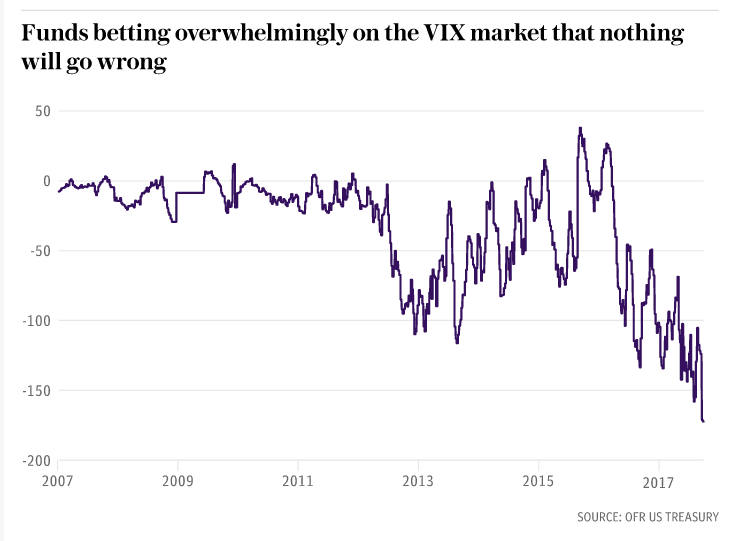 The moment that markets start to fear this happening, it becomes totally self-fulfilling. They won't lend to governments and the whole thing basically implodes," he said. Central banks are now caught in a 'debt trap'. They cannot keep holding rates near zero as global inflation pressures build because that will lead to an even more perilous financial bubble, but they cannot easily raise rates either because it risks blowing up the system. "It is franky scary," he said. The BIS critique is that ever-lower rates and more radical stimulus at the bottom of each successive cycle has itself had the complex effect of lowering the 'Wicksellian' natural rate of interest. Prosperity has been drawn from the future and led to a corrosive 'intertemporal' imbalance. In the end this catches up with you. The authorities may not yet have reached the end of the road but this strategy is clearly pregnant with danger. Global finance has become so sensitive to monetary policy that central banks risk triggering a downturn long before they have built up the safety buffer of 400 to 500 basis points in interest rate cuts needed to fight recessions. Fiscal buffers are not exhausted but they are ever thinner. "We are running out of ammunition. I am afraid that at some point this is going to be resolved with a lot of debt defaults. And what did we do with the demographic dividend? We wasted it," he said. Straight onto the Sneck Lifter, it was so good I didn't even begrudge the sparkler. Definitely the best beer of the trip, I do hope the rather worrying reduction in beers produced at Jennings goes no further.